I hope everyone had a wonderful Christmas holiday! We are still relaxing and cleaning up all the decorations. I'm starting to plan our New Year's menu. 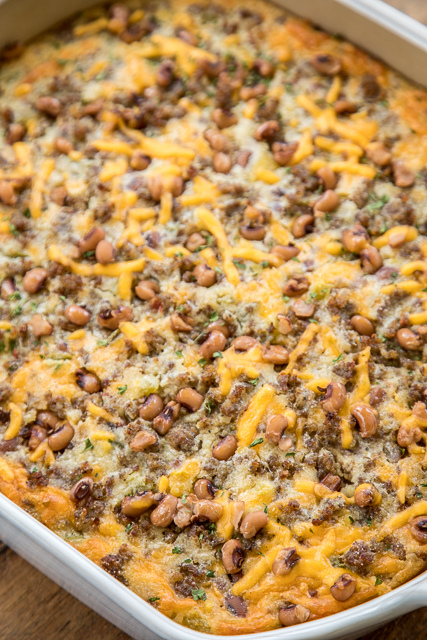 Black eyed peas are a must for New Year's Day. Black eyed peas bring you luck in the new year. I never take any chances with luck in the new year, so we always have eat black eyed peas! 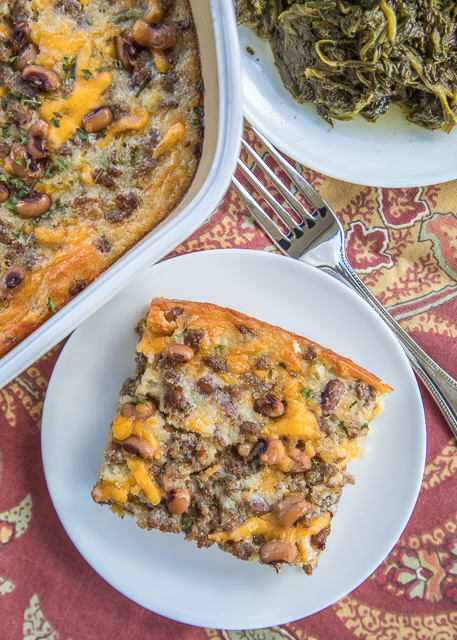 This Black Eyed Pea Cornbread Casserole is loaded with all our favorites! Black eyed peas, sausage, jalapeños, green chiles, cheddar cheese and cornbread. It is ridiculously good! It does have a kick from the jalapeños and green chiles. If you are worried about the heat, I would suggest omitting the jalapeños. All you need is a side of greens and you are all set for your New Year's Day meal! This looks like a lot of ingredients, but you are basically just making homemade cornbread and stirring everything else in the batter. 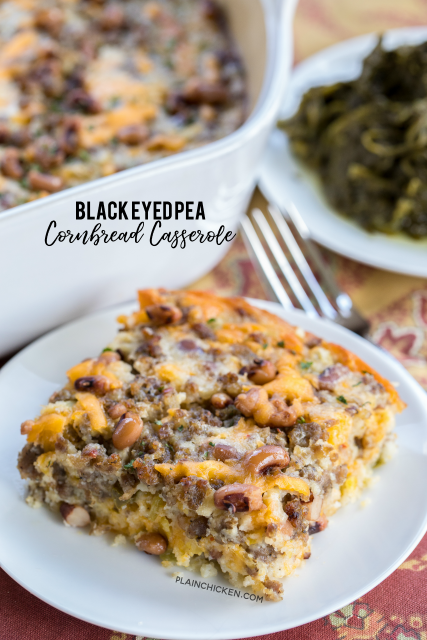 You can make this Black Eyed Pea Cornbread Casserole ahead of time and freeze it for up to a month. Bake the casserole and then freeze it. To reheat the casserole, thaw it and bake covered for 30 minutes at uncovered for 10 minutes. If you want to reheat this casserole frozen, bake it covered for an hour and uncovered for 10 minutes. In a skillet over medium high heat, cook sausage until crumbled and no longer pink. Drain fat. Set aside. Combine cornmeal, flour, salt, baking soda, eggs, buttermilk and oil. 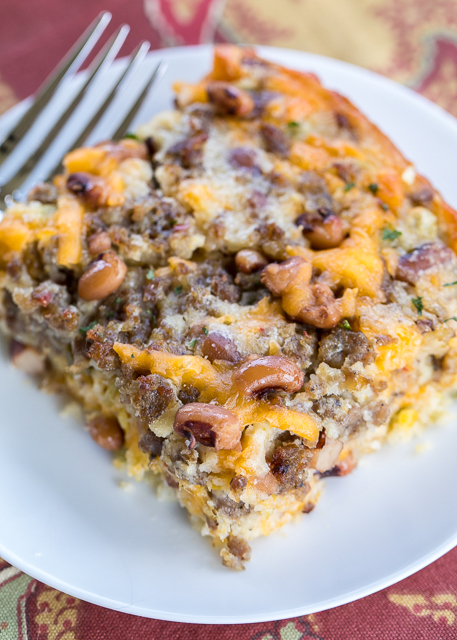 Stir cooked sausage, black eyed peas, cheese, creamed corn, jalapeños and green chiles into cornbread batter. Pour into prepared pan. You can freeze baked cornbread for up to a month. To reheat, thaw and bake covered at 350ºF for 30 minutes and uncovered for 10 minutes. To reheat frozen, baked covered at 350ºF for 1 hour and uncovered for 10 minutes. Can you use Jiffy cornbread mix instead of cornmeal? I haven’t tried that. You will need to omit the salt and baking soda if you try the Jiffy mix. When do you add the creamed corn? How about omitting it or using regular canned or frozen corn? I have only made the recipe as written, so I don't know how it would turn out with those changes. had to run back through trash mail to find. I'm making it tonight, hopefully it taste as good as the trouble I went through to make..................i'm sure it will! Hope you enjoy it!! Happy New Year!! It turned out very oily and greasy. I think 1/2 cup of oil is to much. Mine turned out perfect with 1/2 cup of oil. I definitely don’t think it is too much. If you followed the recipe as written, it would have turned out like the photo. I made it today. Turned out perfect. My husband had a 2nd helping. Can you give me calories for this? Need calories please to add into my daily app. Thank you. I made this today. It was awesome!! I would eat this any day, not just New Years! The only thing I did different than the recipe was adding onion to the sausage while cooking. Making tonight with vegan sausage and vegan cheese. Looks amazing! Smells good too! Could you use the white cornmeal mix like white lily and leave out baking soda, salt? You can give it a try. I haven't tested the recipe that way. How about using beef instead of sausage? Should be fine if that is what you prefer. Enjoy! It will be delicious. Enjoy! Currently in the oven but I just substituted 2 boxes of jiffy corn bread mix instead of making the cornbread from scratch. Fingers crossed. Super excited to make this for dinner tonight !! Swore I had sausage in the freezer, WRONG. So no choice but to use ground beef, I will be sending an update .